I purchased this a month ago from Walmart because I was looking for a concealer that wouldn't dry out under my eyes. This product is meant to adapt to your skin tone, but is also a 2 in 1 concealer with highlighting attributes. My Issue at Hand: On a bad day I have dark blue-purple under eye circles, that seem to like to play peek-a-boo no matter what concealer I wear. I also have very fair skin. By MAC standards (I still question this by all the types I've read to determined your skin tone), I'm a NW15. So, drugstore brands that still state they're fair, can actually look a bit dark on me. What I want: A concealer that can do exactly what it's meant to do, conceal dark under eye circles without any color peeking through. While I do know that this can be remedy but a salmon/peach concealer, I would need one that is light (if anyone has a suggestion, please comment!) enough not to mismatch with my foundation (it's happened). 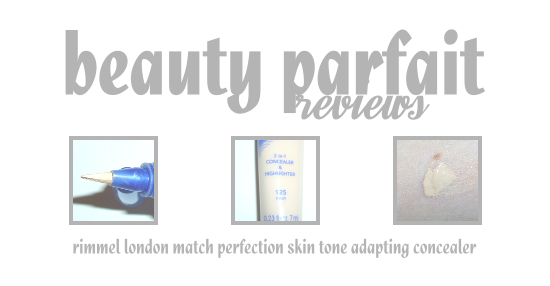 So, is Rimmel London's conceal really Match Perfection? Shade: I got the very lightest shade that Rimmel produces for this, Fair #125. This is STILL ever so slightly darker than my actual skin tone. Just a smidgen. It appears light enough for my skin though, especially via the camera, but in person I can tell the difference. It isn't noticeable to, say a co-worker, but noticeable to myself and my Mother who can only go by shades (ah, yes this is where her colorblindness comes in handy). I do think that this does oxidize on my skin though. Which is why it may appear darker once blended in. That blended swatch wasn't easy, my flash kept blowing out the entire frame because of my vampire skin. Which does not sparkle. Packaging: The package is a basic squeezable tube that has a soft bristle brush on the end where the product dispenses between the bristles. The only issue I've had is sometimes the amount of product that comes out, can't be controlled. This could just be a morning-rush-to-work issue though. Application: This is where I went back and forth on. I would dab it on from the built in brush, then blend in with my Real Techniques base shadow brush. Then the next day I would repeat the first step, but I would pat the concealer in with my ring finger. After going back and forth debating, patting it in with my ring finger won out, it seemed to be more opaque this way than with the brush (what the, that brush has never failed me with a concealer before!). Tip: I discovered if you allow the concealer to sit for about 5 to 10 seconds, it actually conceals much better than blending it in right off the bat. Taken before my dark circles became more apparent. Pigmentation: This is where my issue comes in. This concealer worked brilliantly when I first started using it, but with insomnia hitting, dark circles cometh. The last two weeks, this definitely has been struggling with concealing my oh so lovely blue-purple circles. Even with attempting my tip and letting it set a little longer before patting it in, I could still see my dark circles. Because of this I actually had to go back to my other concealer which is more of a full coverage concealer, BUT it dries the skin out under my eyes. Wait, highlighting? I'm still mildly confused on this, perhaps it's because this isn't a perfect match to my skin tone, but I just couldn't see the highlighting effect that it's suppose to give. Overall Verdict: I do like this concealer, it's creamy, doesn't dry out my skin under the eyes, but it isn't perfect. It's not exact match, plus it has trouble concealing dark blue-purple circles. It works well though if you don't have dark circles or light dark circles though. I do wish that the highlighting worked for me, perhaps that would have canceled out the darkness, or at least masked them. Availability: Just about any Drugstore, Walmart, Ulta or any store that carries Rimmel London. I would love to hear others opinions on this concealer. Any other tips would be awesome!